The author, Bart Baggett, is an Amazon Best Selling Author, author of 7 other books, and has trained thousands of people worldwide to boost self-esteem, increase revenue, and increase self-awareness through his live seminars, books, and home-study courses. This book is 73 pages and contains modern brain research and advanced NLP language strategies based in neuro-science. 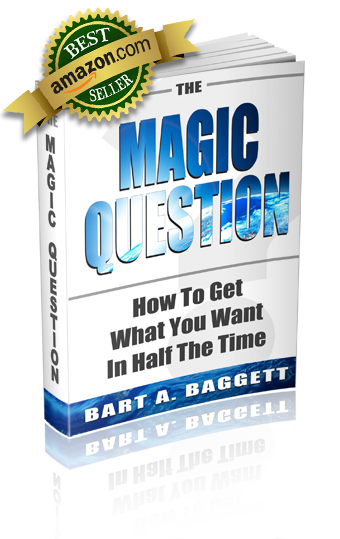 What Will You Discover When You Read the Magic Question? Perfect for anyone wanting to double your income, get a promotion, improve relationshipos, or simply experience more joy on a daily basis. Bart's New Book is 100% Free During This Special Promotion. Limited Time. "This was an amazing read! I can't believe how much science was packed into this short book. It's a simple technique I'm going to start today." "Baggett is one of the smartest minds on the planet. Even if you have studied NLP or Language before, this technique is something fresh and new. I highly recommend it." Copyright 2016 - Empresse Publishing - PDF - All Rights Reserved.